Scrapbooking Vs. Art Journaling – Is There Really a Difference? I have been strong and tried not to get into the world of scrap booking and art journaling. Sure I have tipped my toe into digital scrapbooking, but that is virtual. In other words – there are not more craft supplies to find a home for in my studio. However, my pregnant sister got the most adorable baby book by K&Company called SMASH and I had to have one too. While the kids painted a giant cardboard train today, I worked on my first journal page. Let me start by saying that we have a new Jo-Ann store in south Austin. I spent Sunday morning doing a little crafty damage. This is my loot. Goodies by EK Success, BasicGrey and more. I have never been very good at keeping up with the kids baby books so maybe this is my chance to redeem myself. 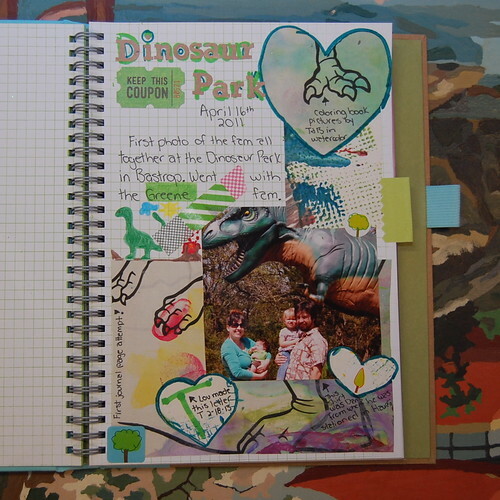 My first page is about a trip to the dinosaur park we took 2 years ago. It was our first family picture together. I tried to make little notes for the kids and grandkids to read one day. I also used pieces of the kids art work on the page. I could easily spend their college fund buying all the cute little doohickies available for my journal, but I’m really going to try not to. Stress try. I leave you with a picture of the kids tagging their Discovery Express Train. They worked on decorating this sucker all day which gave me plenty of time to glue stick pictures, fondle washi tape and look for the perfect decorative paperclip. Let’s just hope it keeps them entertained tomorrow so I can work on my journal some more! P.S. Is Scrapbooking one word or two? P.P.S. Yes that is a dinosaur and erupting volcano that I drew. Posted February 19, 2013 & filed under Uncategorized. There actually is a difference between the two. 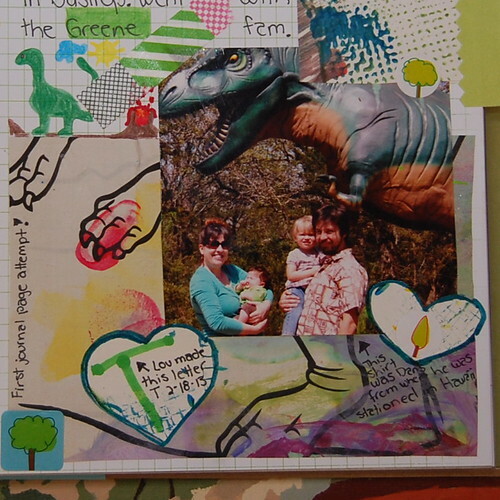 Although I think the Smashbook tries to bridge the gap for those who are coming from a scrapbooking background. Artjournaling.ning.com or people like Less Herger from Comfortableshoesstudio.com, Tammy Garcia from Daisy Yellow and Kelly Kilmer are three great examples of artjourning that embraced artistic expression and journaling. I would like to put the bulk of my pictures into sleeved albums and take the special ones and art journal those. My kids still like to look at their baby books. They are worth the time and money. Comfortably, the article is really the best on this deserving topic. I fit in with your conclusions and will thirstily look forward to your coming updates. Just saying thanks will not just be enough, for the wonderful clarity in your writing. I will right away grab your rss feed to stay informed of any updates. Genuine work and much success in your business efforts!